Gifts for DIYers | Perfect Gift Ideas for the Beginner DIYer on Your List! Do you know someone who wants to spend more time being creative? 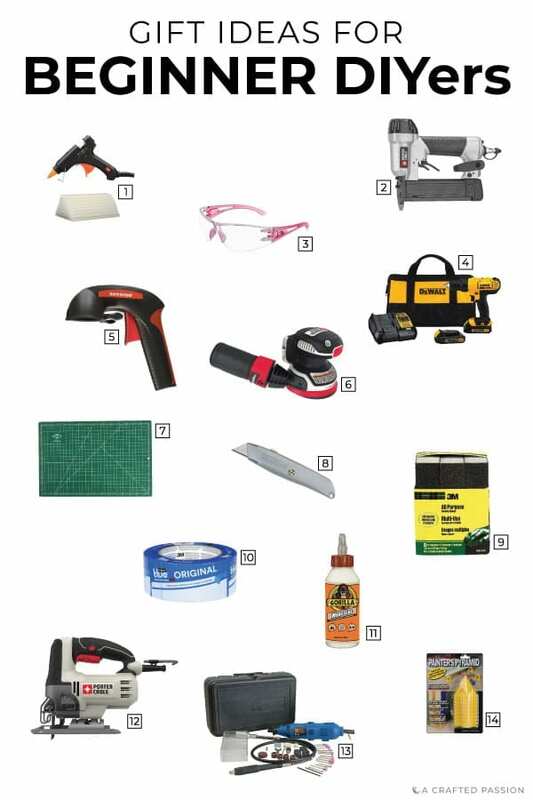 Know someone who is curious about using power tools, but not sure where to start? At one point, this was me too, but after much time just playing around in the garage building things, I am here to tell you anyone can be a DIYer. If you have one of these people on your Christmas list, check out these perfect gifts for DIYers. I’ve made it easy, so all you need to do is click the link below this image for what you think they would appreciate best, or you can head to the idea list board with many more ideas. Hot Glue Gun — Need to hold something together? Making quick decor? Hanging something light? Hot glue can be used for SO many things and every DIYer needs a good hot glue gun. Micropinner — One of my favorite tools….the micropinner is so handy to have to attach wood together without seeing a bunch of nail holes. Safety Glasses — A must-have. The end. Drill — Every DIYer needs a good drill on their workbench. Spray Trigger — I can’t believe I had never used one of these until a month ago. Do you know how many times I’ve had to pause a project because I just literally couldn’t press down the spray paint nozzle any longer. If this DIYer plans to spray paint, you definitely need to get one of these and they’re so cheap. Utility Knife — A utility knife is a retractable, simple cutting edge that can slide through cardboard, shave wood, and is just super handy to have around. Sanding Blocks — The best invention since sliced bread! Ok, maybe not that extreme, but sanding blocks, compared to just regular sandpaper, is amazing! Every DIYer needs a good set of sanding blocks. They’re like sponges for wood and fit in your hand better than flat sandpaper. Painter’s Tape — Painter’s tape isn’t just for painting…Short of clamps? Use painter’s tape to temporarily hold wood together. Mark off where to cut. Use as a cutting guide. I’ve got approximately 234 rolls of blue tape floating around my home at any given time. Wood Glue — Whether you use your finger or a fancy sponge to apply it, wood glue is a must-have to make any wood hold well. Nails are great, but wood glue + nails is even better. Jig Saw — One of my favorite power tools! So versatile, not super intimidating, and has more freedom than a chop saw. Dremel — I got to play with one of these at an event this summer, and I fell in love. You can use different attachments depending on the project and are super easy to use. Painter’s Pyramids — If you plan on doing any sort of painting, these are definitely necessary to save time, and your ground from getting painted on.